For Richard Murphy Architects the story of a new concert hall goes back almost twenty years with studies on the Queen's Hall, including placing a 1200 seat hall on that site by demolishing most of the existing hall. 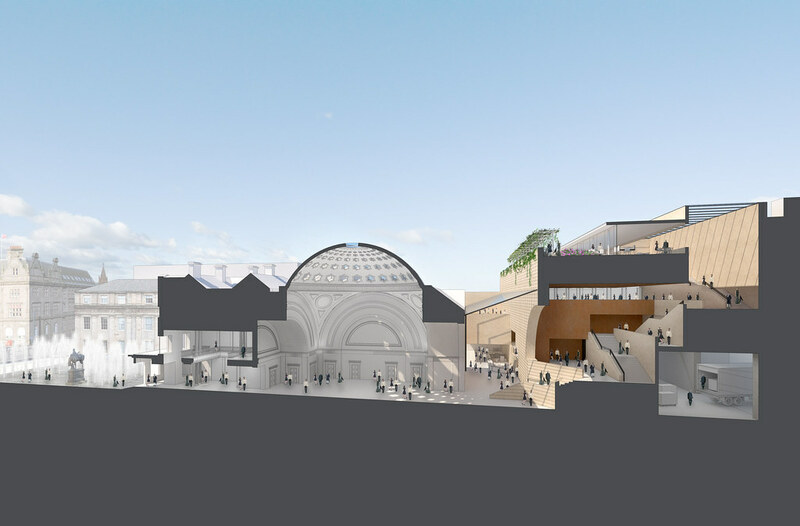 About five years ago, alongside the consideration of an alternative site by others, we ourselves speculatively transmitted and developed an idea brought to us by Simon Laird for using the site behind the Royal Bank of Scotland headquarters on St Andrew Square. 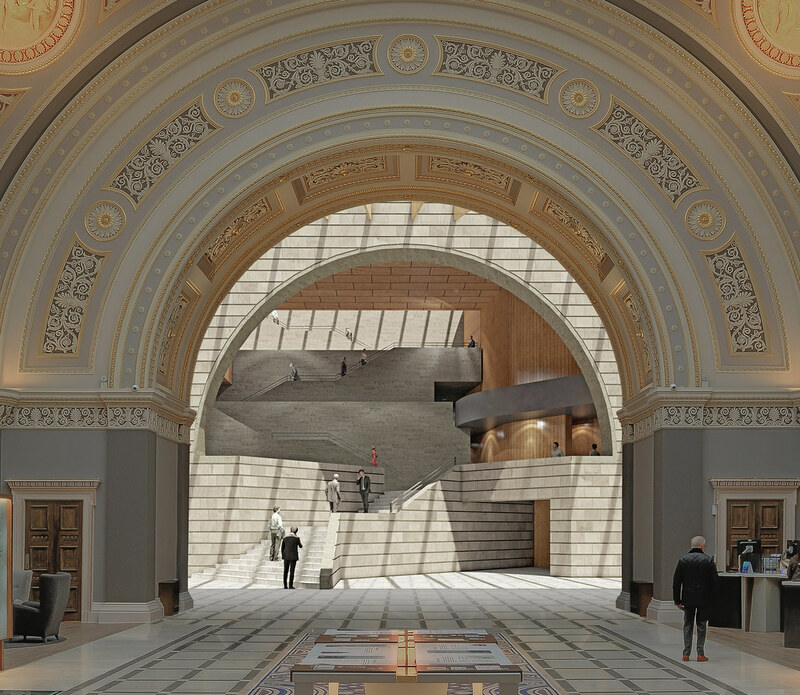 The idea then was that Peddie’s great banking hall with its famous star-studded dome could act as the majority of the foyer and the 1960’s office to the rear would be demolished and a new hall and rehearsal room would be constructed in its place. The site has huge advantages, not least its brilliant location at the end of the First New Town grand axis but also the fact that the rear of the site cannot be seen from any significant part of the New Town so that the exterior of the new build could be relatively inexpensive to construct. 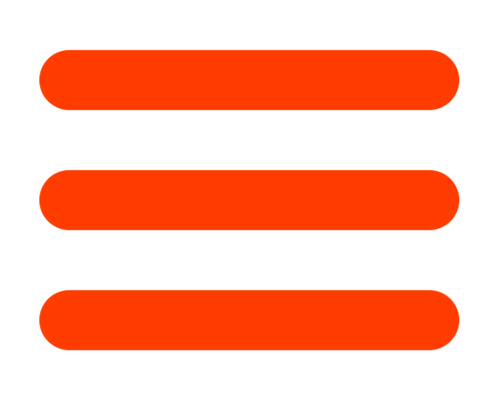 In addition there was a perfect service access off Elder Street. 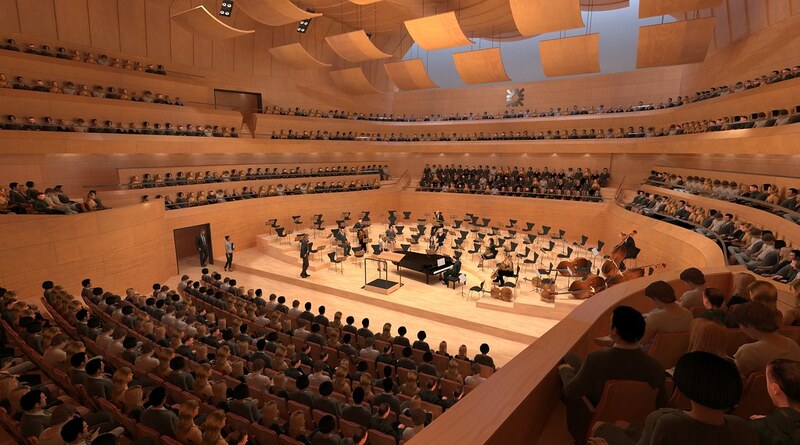 Five years later, we were delighted to be included in the shortlist of six practices following an international competition to find an Architect led Design Team for the design of a new Concert Hall on the same site. The six shortlisted architectural practices included Ourselves, Adjaye Associates, Allies & Morrison, Barozzi Veiga, David Chipperfield, and KPMB. As per the original idea, our competition proposal took the New Town Axis through the building and opened up the rear of Peddie’s hall, allowing the existing hall to form part of the main new Foyer and ensure that that space formed part of the main processional route for audiences to the new hall. 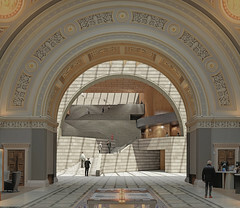 Furthermore, the proposal allowed the original bank building, and its entrance, to be seen and used as the ‘address’ of the new concert hall. 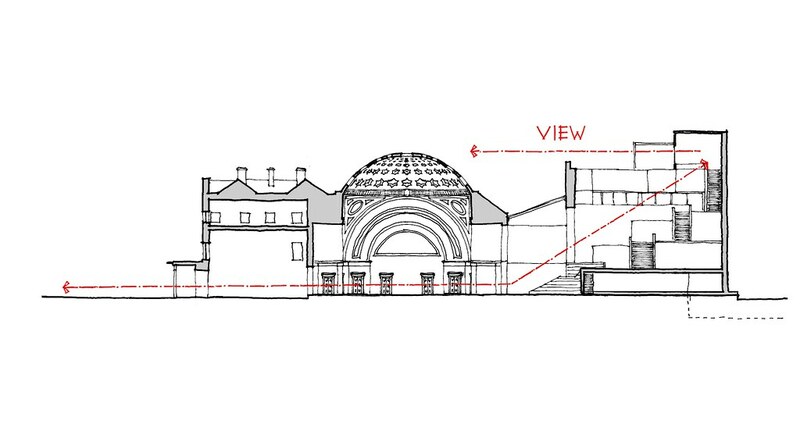 Beyond Peddie's Hall, framed by existing and new arches, a vista of a grand staircase promenade is presented including generous terraces. Hidden sources of light pull visitors up and then turn them 180 degrees on the roof where they would find a roof garden and restaurant and a view back down the George Street axis across the dome as well as capturing the view of the clock tower of the Balmoral hotel, the castle and Arthur’s seat. On the way the staircase would visit all the levels of the main auditorium to the right and the studio to the left as well as an education / conference suite. The bar and café were located at ground level. In order to make the foyer a busy place during the day we suggested four entrances making a number of urban short cuts across the site. By purchasing a shop in Multrees Walk this popular destination could be connected into the foyer. To the east a route to the new St James development and hotel could be made off St James Square at first floor level and to the south a route could be found to Princess Street via West Register Street. 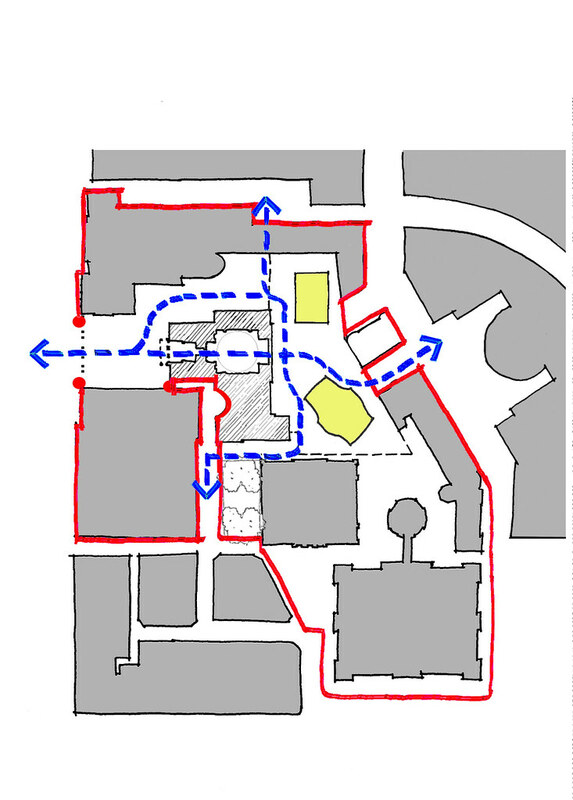 So a hitherto large and impenetrable urban block would be criss-crossed with pedestrian shortcuts. The servicing of the halls would take place all at one level at ground level on the east side using the existing Multrees walk service bay and single level servicing makes for fast “get-in and get-out” ensuring efficient use of both halls. 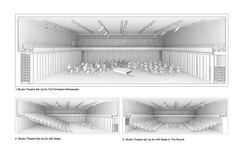 Our design focus for the main auditorium was on the acoustics and ‘intimacy’ of the space, with the aim to design a hall where not one of the 1000 seats was further from the conductor than the equivalent furthest seat in the Queen's Hall and where every single seat was capable of seeing the entire stage. This we achieved. 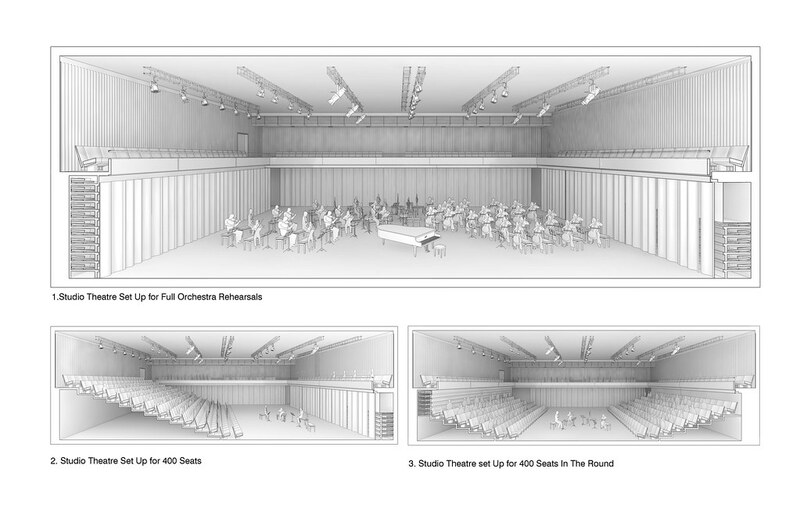 A 400 seat flexible rehearsal room was proposed in order to catch much of the amateur music making that currently takes place in Edinburgh (mostly in churches). 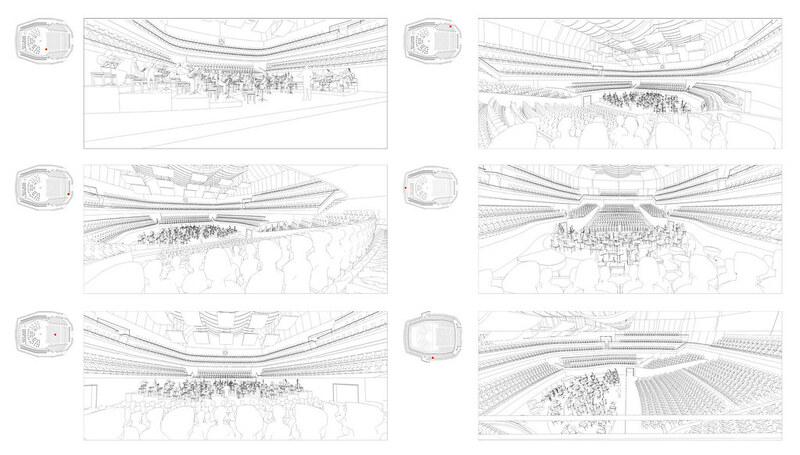 A permanent gallery at first floor level is supplemented by bleacher seating on two sides. 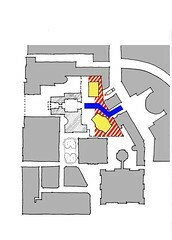 In additional to the proposed main entrance an additional provisional entrance was also provided on the north side of the building. This allowed access to the Concert Hall without the use of the original Banking Hall. 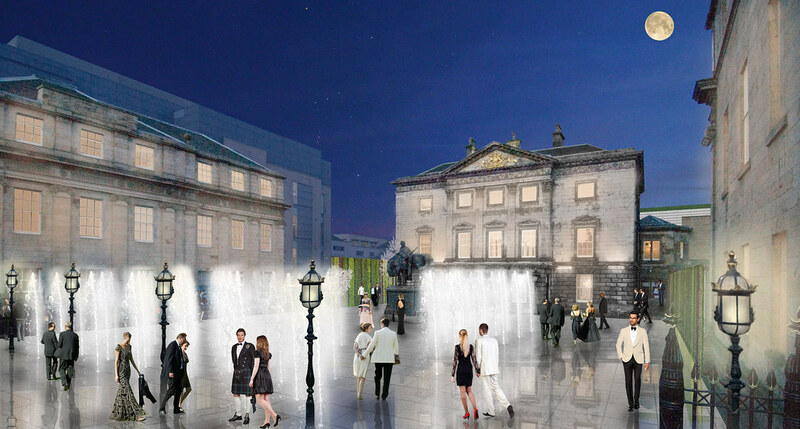 Externally, we proposed filling the forecourt with fountains and removing the railings that separate it from St Andrew Square. 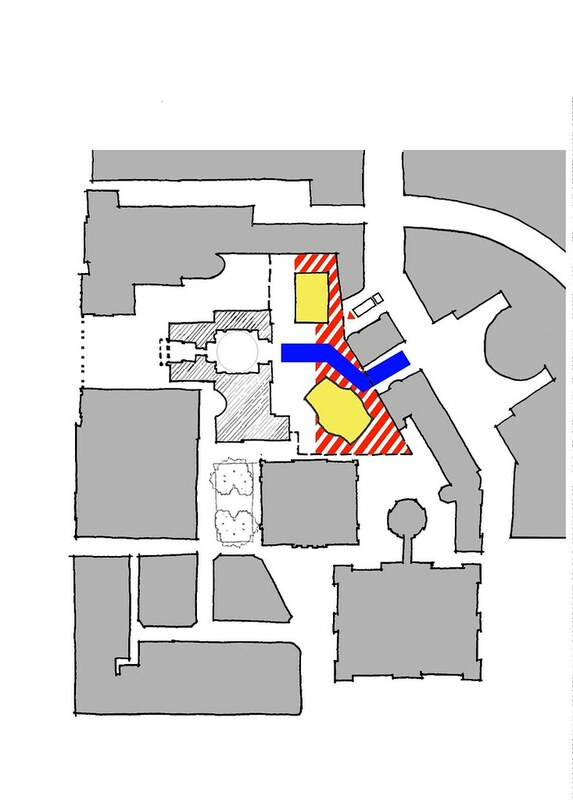 By pre-programming the fountains concert goers could be directed to one corner of the forecourt or be directed to the existing bank buildings front door. Movie 1 takes visitors from St Andrew Square though the provisional entrance, the foyer and into the main auditorium. 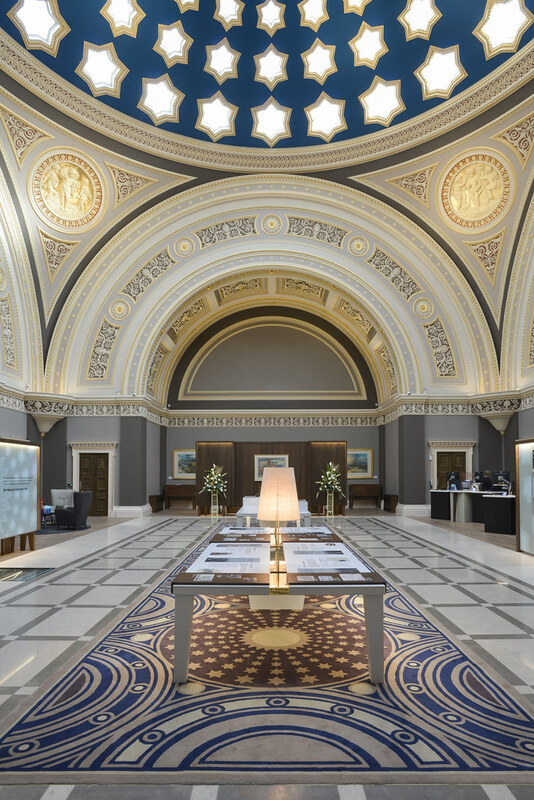 Movie 2 takes visitors from St Andrew Square though the main entrance and banking hall and up the staircase past the education / conference suite and to the restaurant and roof garden with views of Edinburgh monuments. Movie 3 shows an “urban short cut” from the new St James development thought the banking hall to St Andrew Square. 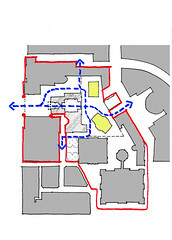 Movie 4 shows entering from the south (near West Register Street) past the bar and concluding in the small hall / rehearsal venue.